Mustard leaf Mash / Rai Sorisha Shak Bhorta / Lai Shaker Kacha Chatni is traditional food of Sylhet. Yellow mustard / Rai Sorisha is called Lai by the local people of Sylhet. 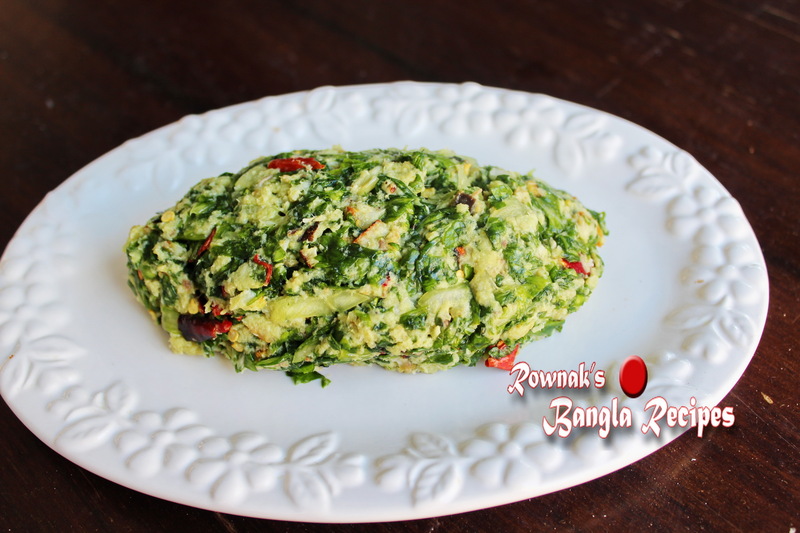 Here mustard leaf / Rai Sorisha Shak is used raw in this recipe which is very unusual in Bangladeshi cooking. Usually leafy vegetables or any type of vegetables are used cooked in Bangladeshi Cuisine except salad. Some of us will ask where to find this leafy vegetables, my suggestion will be just grow it(it even grows well in tub). So enjoy this traditional Sylhety unique recipe. Fry fish with pinch of turmeric and salt; skin off and debone the fish. Remove the stem of the leaf and take only leaf, wash, strain and finely chopped it. Mas this leaf with salt. Then mix rest ingredients with it and enjoy Mustard leaf Mash / Rai Sorisha Shak Bhorta / Lai Shak Bhorta with steamy hot rice. We have this with mackerel fish here in the UK, its delicious.